Does the phrase 'a goal came out of nothing' sound familiar? That is what Mainz's players probably felt when Marcel Sabitzer put RB Leipzig 1-0 ahead on Wednesday night, given the way they glared into space, disbelief written all over their faces. Mainz had largely controlled proceedings at the Opel Arena until Leipzig struck, sparking a riot with both teams going hell for leather for the points. To reduce Sabitzer's headed match-opening goal to a bolt from the blue would not be giving the due credit to a man who has made a habit out of creating such moments, however. 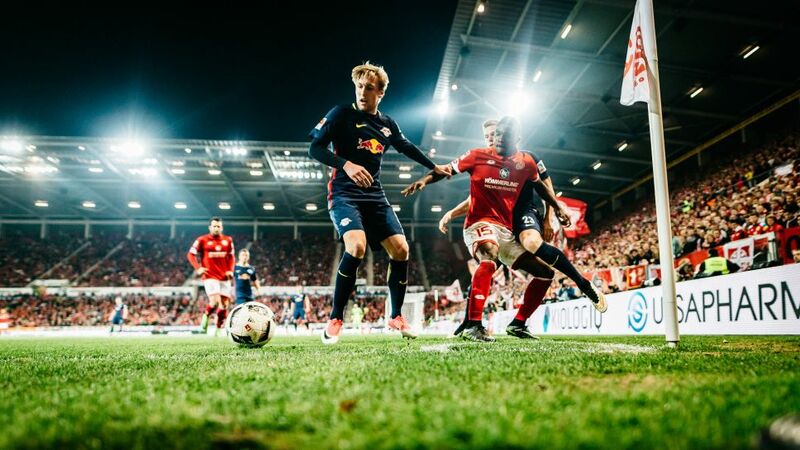 Sweden international Emil Forsberg once again was the cunning architect, his kung-fu-style leap earning possession and his backheeled cross befuddling the entire Mainz rearguard, and the numerous fans watching on. After a second successive win, Forsberg's European forays next season may not be limited just to games for his country: Leipzig are well on course for UEFA Champions League football too, and the continent's leading assist provider - with 13 to his name - is having to get used to answering questions in an array of languages, such are the demands he can expect representing Leipzig next season. Forsberg: Yes, but that's how it is sometimes when it's a tight game and you want to stay on the field, but of course I can understand the change and the most important thing is that we won, of course. Question: After Naby Keita made it 3-1, why were you applauding for such a long time? Forsberg: It was a very important goal and a pretty one at that. Look – if he hadn't scored that goal, we would have drawn 2-2. Read: Mainz 2-3 Leipzig - match report. Question: Your young defender Dayotchanculle Upamecano was substituted even before half-time because he was at risk of getting sent off. Does he need a lot of your help to learn? Forsberg: No, I think he played really well. It was a difficult game for him against Cordoba, who's a very robust player. That's not easy. He had been booked and so you've got to do something, but he's still a very good player and I've never doubted him. Forsberg: It was a game full of challenges tonight and I wasn't really involved to begin with, but in the end we won and I provided two assists. Forsberg: Yes, but we've got a lot of players who are good on the ball and can put ideas into practice, but as a team we're super. Question: Your rivals Hoffenheim and Dortmund both won on the day before your game – did that have any influence? Forsberg: No, we didn't even talk about our rivals. We just wanted to win here and we've done that, and now we move on to our next game. Question: But you must have heard about their results..
Forsberg (smiles): Yes, because I'm interested in football, but I'm focusing on our football and on what we're doing.